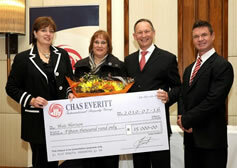 With each Chas Everitt office having chosen a local organisation to support, it was decided by the Chas Everitt Cape Region to ask the various organisations to submit a brief application for a grant of R30 000 from the Cape Region of Chas Everitt. The response to the R30 000 grant application was very positive according to Andre de Villiers, Chas Everitt's National Marketing Manager. "There is so much need amongst welfare organisations at this time, as money has clearly been tight during the tough economic times we have all endured, it is clear that organisations have been really battling to make ends meet as donations have declined during this period. Chas Everitt Western Cape is pleased that our contribution will go some way for two organisations that were selected to share the R30 000. The R30 000 Regional grants (one per Region) is only one aspect of the Chas Cares programme in the Region where local Chas Everitt offices have all chosen a local welfare organisation in their respective areas to support. The successful applicants each receiving R15 000 are SARDA (South African Riding for the Disabled Association) and Horison House Centre (for the care of intellectually disabled adult people). Chas Everitt Randburg visited the Ann Harding Cheshire Home for the physically handicapped during July 2011. A cheque of R3000 was handed over by Tilla Everitt to the manager, Willem Roos and for tea the agents provided doughnuts as a special treat. It was, as always, so uplifting chatting and socializing with most of the 40 residents. A tour of the thrift shop proved to be quite an adventure. To the volunteers who man the shop, a huge thank you for the wonderful service you render together with your special four legged staff member. As always, Chas Everitt was bowled over by the friendliness and optimism of all. Handover of blankets to the City Hope project - part of an outreach organised by City Hill Church in Hillcrest. This ministry works with preschools and orphans in the surrounding rural areas. As part of the ChasCares program the East London team have selected Little Beacon Pre-Primary School. We have pledged R10 000 towards the schools re-branding and refurbishment. We are assisting in the collection of items that the school is in need of such as books, toys, playground equipment etc. So far we have donated R20 000 worth of toys, cots and other goods. With the help of other local businesses in the area we aim to collect enough goods and donations to be able to give this school the transformation it so desperately needs. This Retirement Village is situated in one of the less affluent suburbs in the Nelson Mandela Metro namely Sydenham. They cater for 39 homeless elderly people who have minimum pensionable income. The matron, who is an elderly person of 79 herself, runs the facility with the help of a few workers without any financial assistance other than a few small donations from the public. Conditions at the home are in a state of bad repair and the facilities are less than desirable. Any contributions that we can raise in terms of financial, groceries and maintenance would benefit this facility greatly. Charlotte and her team from the Chas Everitt PE office have affiliated themselves with Reach for a Dream this year. Music trivia evenings have been arranged to bring in money and they visited the Dora Nginza Hospitals’ Paediatric Ward as that is one of the focus points for Reach for a Dream. They have managed to raise money to kit out a playroom in a ward that the hospital have allocated to them, however no kids are able to play in this playroom because there is no supervision thus the playroom is locked for most of the time. They have decided to come on board and put a roster together to ensure that there is supervision to allow these children to play in this wonderful playroom. The initial visit to the hospital was just to meet the kids, take party packs to them and give each child a colouring in book, crayons and a book. They spent some time with these kids colouring in and reading stories to them. “In most instances, there is heart wrenching stories attached to these kids”, said Charlotte.